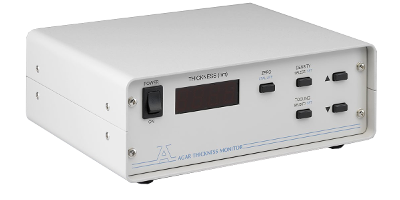 The High Resolution Thickness Monitor / Thickness Controller are based on the principle that the oscillating frequency of a quartz crystal is changed by the mass of a deposited film on its upper face. Electronically measuring this effect allows for a determination of the thickness of a deposited film. Once the density of the evaporated material is entered into the system, the thickness is measured to a resolution of 0.1nm on a four digit LED display having a range of 0-999.9 nanometers. The crystal and holder are mounted in the vacuum chamber and connected to the FTM Power Supply via the supplied vacuum feedthrough. CS-108; Diameter 10mm up to a plate/flange thickness of 9mm.